On the evening of July 7, pink clouds billow over Pilsen, and the National Museum of Mexican Art is abuzz. The line for the museum’s thirtieth birthday pachanga stretches down a long hallway, however despite the long wait, the crowd is jubilant. The beaming woman next to me in line for popcorn is Leticia Madrigal, the founder of Ámate Ahora—“Love Yourself Now”—a Pilsen health organization that hosts their annual expo in the room we now stand in. She recalls her first meeting with NMMA founder and president Carlos Tortolero at the first Ámate Ahora expo, how he greeted her with joy and told her that the museum is her home. Our exchange continues, drifting from healing to honor to César Chávez, but every thread of conversation leads back to Tortolero, his leadership, and his impact. Madrigal has high hopes for the NMMA’s future, and she refers to the man and the museum interchangeably, substituting the part for the whole in a telling synecdoche. 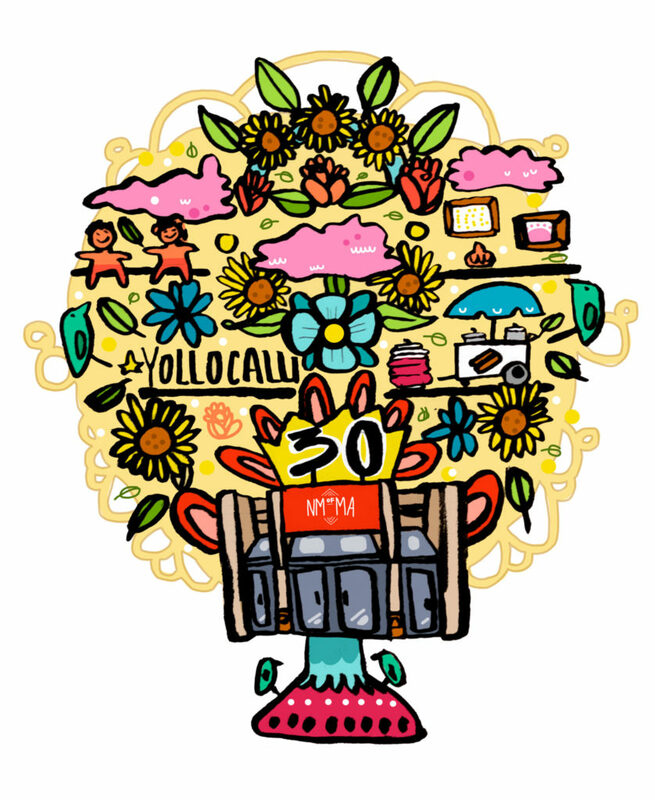 Whether by giving space to nonprofits like Madrigal’s, catering food from neighborhood businesses, or encouraging youth artistic and political engagement through Yollocalli, the NMMA plays an important role not only in Pilsen’s culture but in its general well-being. However, in Tienda Tzintzuntzán, the museum’s gift shop, a humble Tortolero demurs at the praise of his friends and colleagues. “They lie, they lie, they lie,” he chuckled. Tortolero moved to Chicago from Mexico as a young child. In 1987, he and a group of fellow CPS educators opened the Mexican Fine Arts Center Museum with a small budget and an emphasis on accessibility, education, and social justice. Thirty years, a name change, and countless expansions later, the National Museum of Mexican Art sees 130,000 visitors annually, is home to one of the U.S.’s largest Mexican art collections, and was the first Latinx museum accredited by the American Alliance of Museums. The museum’s president is charming, bespectacled, and a gifted storyteller. He pauses occasionally to chat with friends and donors, but always returns to our conversation without missing a beat. “We show the beauty of Mexican art and culture from both sides of the border, from ancient times to the present,” said Tortolero. He makes clear that amidst the museum’s growth and development, its core principles have not changed. “I have this weird philosophy,” he began. “I do believe that everybody’s equal. It’s not a slogan.” While the museum is focused on Mexican art sin fronteras, Tortolero hopes to draw in a range of people through its exhibits and programming. And whether it’s through fostering youth programs like Yollocalli or encouraging children to visit the museum, he describes intergenerational engagement as a vital part of the NMMA. While he sees retirement in his future and says that he’ll “be gone for sure thirty years from now,” Tortolero places high expectations on the NMMA. As Chicago neighborhoods contend with Trump administration policies, he believes that institutions like the one he leads need to be more vocal than ever. “Artists need to speak up,” he said. “Arts administrations need to speak up. As long as racism persists we have to be out there making sure we speak out against it.” He cites A Day Without a Mexican, a film directed by Sergio Arau and sponsored by the museum, as an important example of artistic protest. And like Madrigal, he links the museum’s bright future with community support. On the dance floor, the pachanga continues at peak energy. Children hold hands and spin in circles, NMMA employees slice a beautiful cake topped with a fondant ojo de dios, and Efrain Lopez, who has worked as the museum’s carpenter for twenty-eight years, serves up homemade aguas frescas. Beneath a slideshow listing thirty years of museum milestones rests the DJ booth, where Sonorama’s Edward Baca spins a vibrant soundtrack for the scene. Baca is one third of Sonorama, a trio of self-described “vinyl heads” who seek out classic Latin American music of all genres. The DJs play parties, publish podcasts, and host a weekly show on Lumpen Radio. Although Baca doesn’t have a long history with the museum, he admires its support of local businesses as well as local art, recalling a 2015 fundraiser for well-loved, burnt-down restaurant Nuevo Leon. He also finds artistic encouragement in its collections. Elizabeth Garcia, an incoming student at the University of Illinois at Chicago’s medical school, expresses a similar sentiment. She first came to the NMMA while working as a mentor in nearby schools and noticed students’ excitement at seeing familiar figures like the Virgin of Guadalupe represented within a museum context. Garcia also believes that the NMMA’s ability to foster personal and political engagement makes it a source of strength for her community. While gentrifying actions like the recent painting over of the Casa Aztlan murals by real estate developers upset her, she said that visiting the museum always helps her feel better. The author made me feel as if I were there.